Plans for a bus service to return to a Ribble Valley village have been praised by council leaders, after it was removed earlier this year. Sabden in East Lancashire was left without regular public transport links in May, after Transdev withdrew its mainline commercial bus service from the village. But Lancashire County Council bosses are now set to use cash contributions from a housing development to fund a new service to the estate in Henthorn, Clitheroe, and create new bus links to Sabden. The proposal was discussed at Tuesday’s executive scrutiny committee at County Hall in Preston, and a decision on the scheme is due to be made by County Coun John Fillis, the authority’s cabinet member for highways and transport. Speaking at the public meeting, Coun Fillis said: “I want to say a big thank you to our officers for the excellent work they have undertaken here, because this hasn’t been straight forward. “It’s involved the developer, planning conditions, section 106 funding, five routes, and ensuring nobody loses out in this. “That’s enabled Sabden to have a regular bus service for at least the next five years. “What the officers have been able to do here is, I believe, something really quite different, something we’ve never done before as far as I can gather, so they really have done an excellent job. A report on the proposed changes was presented to the committee by Oliver Starkey, the council’s head of public and integrated transport. If approved, the changes will come into force on December 5. Following the removal of the regular transport links to Sabden in May, discussions were held with commercial bus operators to see if they would be willing to provide a service, but the meeting heard none were. Meetings were held in an attempt to come up with a “community-based transport solution”, but that was not possible either. 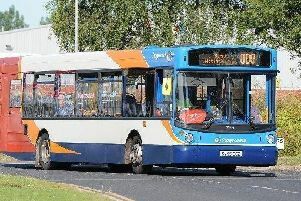 The community transport provider in the area also said it was unable to provide a more regular service than its single weekly return journey to Clitheroe. The loss of the service affected all types of journeys, according to council officers, including for work, education, medical needs and leisure. Now leaders are planning to revise the tendered bus network in the Ribble Valley, through a funding contribution from the Ribble Meadows development, in the Henthorn area of Clitheroe. In 2012, the owners and developers of Henthorn Farm agreed to provide a bus service between the development, known as Ribble Meadows, and Clitheroe town centre, after a certain level of residential occupation, for five years. The planned move will extend the bus service in the Henthorn area of Clitheroe, where the development is, and will also allow a public transport service for Sabden to be provided. It is proposed the Clitheroe town service two will have a revised route and timetable. It will no longer serve Peel Park, but the route will be extended around Lune Road within the Henthorn Ribble Meadows development. The service will operate every 30 minutes during the daytime on Monday to Saturday, while Peel Park will be served by the reinstated service four and revised service five. Service four is proposed to be extended through Whalley to Sabden and Padiham. It will operate generally every two hours from Monday to Saturday during the day, and will incorporate the 634 school bus service for students from Sabden to Clitheroe Royal Grammar School. A revised route and timetable is proposed for service five, to continue to provide a two-hourly Monday to Saturday daytime service between Chipping and Clitheroe. The route between Clitheroe and Whalley, serving Peel Park, will access more of the area at the request of residents and will operate hourly, in conjunction with service four. It is proposed to revise the timetable of service 35 to continue to provide a two-hourly Monday to Saturday daytime service between Longridge and Blackburn. Along with service five, an hourly service will be maintained between Longridge and Ribchester.